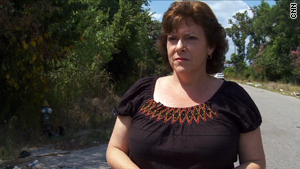 Houston, Texas (CNN) -- In the scorching summer heat, Deborah Hoffman can be found patrolling a section of Houston, Texas, that she's dubbed "The Corridor of Cruelty." "It's basically a dumping ground for live and dead animals," said Hoffman. The corridor -- an area more than a mile wide where abused dogs are abandoned -- is located in northeast Houston near the Little York exit off U.S. 59 (Eastex Freeway). "One of the saddest cases is when I come across one in a large green Hefty [trash] bag," said Hoffman. "Some of the dogs that we find in the bags ... [have] some serious wounds ... most likely from dog fighting." Hoffman, 52, started the nonprofit Corridor Rescue, and for nearly two years, she and her team of volunteers have been rescuing dogs from this area and shedding light on the neglect of these animals. In Texas, it is a criminal offense to abandon dogs, according to Assistant District Attorney Belinda Smith. As a result of Hoffman's efforts, Smith says her office has filed criminal cases against people who have dumped their dogs. "Deborah not only brought the problem to our attention, but she takes it a step further -- she tries to find homes for animals that have been dumped," said Smith. Separately, in November 2008, Houston executed the largest dog fighting sting in the country to date, said Smith. As a result, 60 people were convicted and 168 dogs were seized. Hoffman has been involved in animal welfare for years and first came in contact with the corridor as a volunteer for a rescue group in 2006. Within a couple of months she rescued six dogs from the area. A return visit in August 2008 moved her to rally her community for help. The Corridor of Cruelty is in Houston, Texas, off U.S. 59 (Eastex Freeway) at the Little York exit. On a tip from a friend, she went back to the area to search for a pregnant dog in need of rescue. She saw the place still teeming with emaciated and scared dogs fighting for food, shelter and their lives. "I took my 12-year-old daughter with me, and we spent the afternoon driving this neighborhood," said Hoffman. "[We] both literally were in tears by the end of our journey." Soon after, those tears turned to action. Hoffman sent out a mass e-mail to fellow animal lovers begging for help. "[I] said ... 'We have an absolute atrocity going on day-in and day-out. And I'm calling this place The Corridor of Cruelty. There [are] animals scrounging around for food constantly. They're running in ditches with broken legs, broken bodies, pregnant. People, come out and help.' "
Many heeded the call, and Hoffman and her "active army," as she calls it, started waging war on the corridor. In addition to the district attorney's office, Hoffman's efforts have gotten the ear of city council members, mayoral candidates and the police department, which set up cameras in the corridor to try to capture people dumping animals. The group also educates community members about anti-cruelty laws and spaying and neutering their pets. Once rescued, the dogs are taken to a vet before they're placed with a foster family or another rescue group. "We literally are in a crisis here in Houston," said Hoffman. "Enough is enough in the corridor. Things have got to change." Hoffman and her group have set up 18 feeding stations throughout the area. Volunteers fill the bowls of food and water at each station six days a week, laying out a total of 600 pounds of food a week. "We are keeping animals alive until we can get to some of them and bring them to safety," said Hoffman. Hoffman coordinates all of the rescues. Some dogs come up to the volunteers and want to jump in their vehicles; others are afraid, so Hoffman and two other designated volunteers trap them using snares and slip leads, among other means. While the corridor is safe for volunteers during the day, said Hoffman, the group's protocol is to never be out there after dark, even though no one has ever been bitten or attacked by a dog, she said. Once rescued, the dogs are taken to a vet to be treated before they are placed with a foster family or other rescue group. Hoffman often tries to place dogs before they are rescued. While in the field, volunteers photograph the dogs, and Hoffman e-mails the images to her group's vast network, which includes rescue groups for specific types of dogs. There [are] animals scrounging around for food ... running in ditches with broken legs, broken bodies. "Hopefully we'll get someone to say, 'OK, I'll take that golden retriever,' " she said. "So we're really working together as a community." Corridor Rescue covers the cost of food, a crate and vet bills for dogs that are fostered through them. Dogs that aren't immediately placed with a family or other rescue group go into boarding facilities until Corridor Rescue can find them a home. "Volunteers and myself go visit these dogs on a weekly basis, so it gives them more social interaction," said Hoffman. "We bring treats, blankets, take them outside on walks and hug them a lot." Hoffman relies heavily on private donations to keep the operation going. So far, the group has relocated more than 180 strays from the corridor. "The most proud moments are when we take a dog that is in horrible condition and we bring it back to life," said Hoffman. 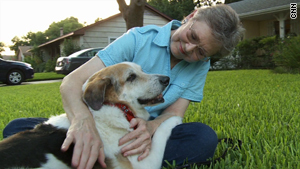 Corridor Rescue not only saves lives but helps build families as well, like Joan McKinney and her adoptive dog, Lotto. Hoffman and her group rescued Lotto from the corridor in 2009. Hoffman helped give Lotto the dog a home with Joan McKinney. "It's truly a miracle, taking a dog like Lotto, in that bad a condition off the streets, and then putting him in a loving home with someone like Joan," said Hoffman. "Lotto brings a lot of joy in my life. 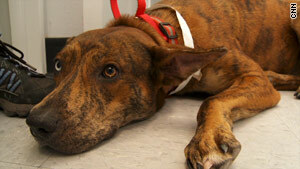 He's the sweetest dog," said McKinney. For Hoffman, the war will never be won until animal abandonment is extinct. "Animal rescue is what I will do for the rest of my life," she said. "I'll be ... trying to save an animal from my rocking chair." Want to get involved? Check out the Corridor Rescue website at www.corridorrescue.org and see how to help. You can nominate a 2010 CNN Hero at cnnheroes.com. CNN's Erika Clarke contributed to this report.